Analyzed fields of ocean circulation and the flux form of the potential vorticity equation are used to map the creation and subsequent circulation of low potential vorticity waters known as Subtropical Mode Water (STMW) in the North Atlantic. 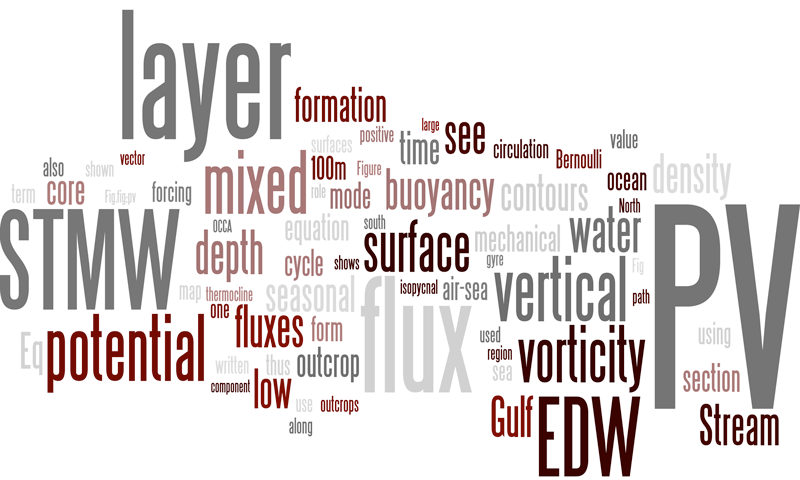 Novel mapping techniques are applied to (i) render the seasonal cycle and annual-mean mixed layer vertical flux of potential vorticity (PV) through outcrops and (ii) visualize the extraction of PV from the mode water layer in winter, over and to the south of the Gulf Stream. Both buoyancy loss and wind forcing contribute to the extraction of PV, but we find that the former greatly exceeds the latter. The subsequent path of STMW is also mapped using Bernoulli contours on isopycnal surfaces.